Summary: Raffa Santana is a gifted apothecary, training under his stern father. He has an intuition about mixing potions and infusions that often prove to be effective at healing. 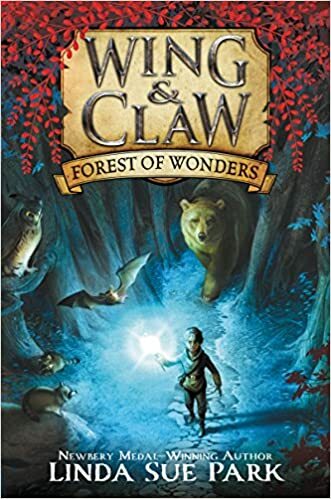 On his first independent trip to the Forest of Wonders, accompanied only by his cousin Garith, he discovers a mysterious red vine. When he later uses it to treat an injured bat, he is amazed to find out that the vine gives the power of speech to animals. Garith takes part of the vine with him when he and his father move to the capital city. When Raffa learns of other more dangerous properties the vine has, he knows he must travel to Garith’s new home to warn him. He undertakes a perilous journey, befriending two somewhat mysterious girls along the way, and discovers the real, ominous reason Garith and his father have moved. The four kids have to make a daring escape, and the end of the book finds them on their own, surrounded by adults who want to put a stop to their rebellion. The first chapter of the next book in the series is included to whet readers’ appetites for more. 352 pages; grades 4-7. Pros: Interesting characters, plenty of action, talking animals, and a good dose of magic will please fantasy fans. Cons: Is it just me, or is it grating to refer to dawn as “daybirth”, or have the characters wish each other “Steady morning”? It seems a little pretentious when compared to the humor of a Rick Riordan or J. K. Rowling.